Is goat’s milk the new skincare essential? CHENNAI: It was her daughter’s battle with eczema that prompted Kruthika Kumaran to look for skincare products that would suit her. After enrolling in a course in natural cosmetology, she began experimenting till she came upon the magic potion – goat’s milk. “I have an agricultural background and know the benefits of goat’s milk. It is rich in essential fatty acids and triglycerides, both of which are moisturising. The fatty acids also have a pH similar to humans and is less irritating,” says the Coimbatore-based entrepreneur, who began manufacturing and selling goatmilk soaps under her brand Vilvah, which she launched in 2017. “It also has selenium, a mineral, which is good for sensitive skin,” says Kruthika. 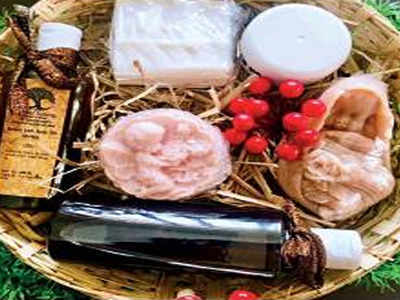 She is among the few entrepreneurs in the country who are manufacturing skincare products with goat milk, something which is also used by big brands. And while dermatologists are sceptical of how useful the products may be, they are slowly gaining popularity. “When I started out, we had 10 goats on our farm, now we have about 100. All the ingredients used are from our farm or sourced from local farmers,” says Kruthika, who now makes goat milk soap, body wash and shampoo. “I have tried it on my daughter and it has made a difference. It also benefits people with acne or sensitive skin,” she says. While they have a store in Coimbatore, the products are sold online. In Kochi, Lakshmi Sreenath also discovered the benefits of goat milk while looking for natural products that would help her son fight eczema. Lakshmi, began making hair oil before she moved on to goat milk soaps. “It’s not easy to source it so I started out by using goat milk powder. Later, my uncle who has a dairy farm, began rearing goats for me,” says Lakshmi, who launched her brand, Herbal Sutras, two years ago. She makes only 20 soaps at a time and doesn’t add any fragrance or essential oils to keep it natural. “It is made of goat’s milk, calamine, olive oil, coconut oil and castor oil,” says Lakshmi, who is planning to scale up her business by procuring more goat’s milk from other farmers. “I am also going to try donkey’s milk as it’s also good for the skin,” says Lakshmi. However, doctors do not endorse the products. “Just like cow’s milk, goat’s milk too is good for the skin. But the way it’s manufactured is more important as it’s not easy to do at home and there are many additives,” says dermatologist Dr Maya Vedamurthy. Dr Vaaruni Ravishankar says no soap, as a single use product, can ‘cure’ a skin disease. “Skincare is always a long-term, multifactorial process. Soaps are made by a process known as saponification wherein fats or oils and alkali crystals are added to a base which can be water or milk. In these soaps, goat’s milk is the base,” she says. Goat’s milk on its own is not harmful and can hydrate the skin. “It doesn’t alter the pH of your skin or irritate it. It also contains vitamins but in soap formulation this benefit is questionable,” says Dr Vaaruni. “However, the overall effect of the soap is based on the milk in addition to the fats and crystals. Hence not every soap under the label of goat’s milk is necessarily beneficial. Based on the other additives, the soaps can affect the skin,” says the dermatologist, who urges users to read labels. Designed using & Magazine Hoot. Powered by InternetIncomePillars.